Treasure hunt games have been around for a long time and are one of the most popular themes for a slot. 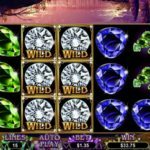 Gemtopia by Realtime Gaming is one such game where a machine is filled with precious stones that you can win when you find them. There are special features in the game, such as re-spins and free spins which can get you big wins and bonus rewards. 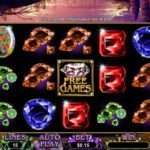 It is a 5-reel, 15 payline slot. The game has excellent visuals. The cave, which is the background of the game, is filled with stones and jewels twinkling against the dark cave. The theme songs fit the game perfectly and you will dive deep into the game within a minute. The wins are counted both ways – left-to-right or right-to-left. This doubles the player’s opportunities of winnings. Green, yellow, and brown varieties of stone pay the least. For bigger payouts, look out for green, blue, and red gems. The top prize is for a multi-colored oval stone that pays 500x your bet. The wild symbols show up on the center three reels. When one of them appear, they expand to cover all the three positions. With this, you can substitute other symbols to create a winning combination. Apart from this, you will get a re-spin feature where these wild remain as sticky wilds. Pink diamonds are the scatter symbols. They will get double your spin if you get three anywhere. 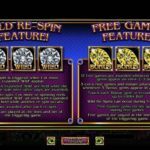 You will also receive 15 free spins. Landing three yellow bonus symbols will get you three extra free spins. There are two progressive jackpots – smaller minor jackpot, and the larger major progressive. The major one pays out several thousand dollars. Though the theme of the slot might feel a little old-fashioned, the game itself has been designed quite decently. It is simple but the visuals are quite good. Expanding wilds are a concept in this game, which most people are coming to accept now. For another great and engaging game you should consider playing Dragon Orb by RealTime Gaming.